Women's Original Starcloud Tall Rain Boots is rated 4.4 out of 5 by 83. Elaboradas a mano de manera individual con un acabado brillante, la bota alta Original Starcloud tiene todas las características de una bota de agua impermeable con un divertido elemento extra. Ideal para festivales, esta bota está elaborada a mano a partir de 28 piezas en caucho natural. Rated 5 out of 5 by Kyleigh from Favorite boots! I bought these boots a month ago and wear them at least 3 times a week! The color and durability are awesome! I love how the multicolor glitter looks in different lighting! Rated 5 out of 5 by iammonkee from Beautiful! Bright purple AND glitter?! Yes. The best boots I’ve ever owned. Rated 5 out of 5 by Khrissa92 from Amazing boots! 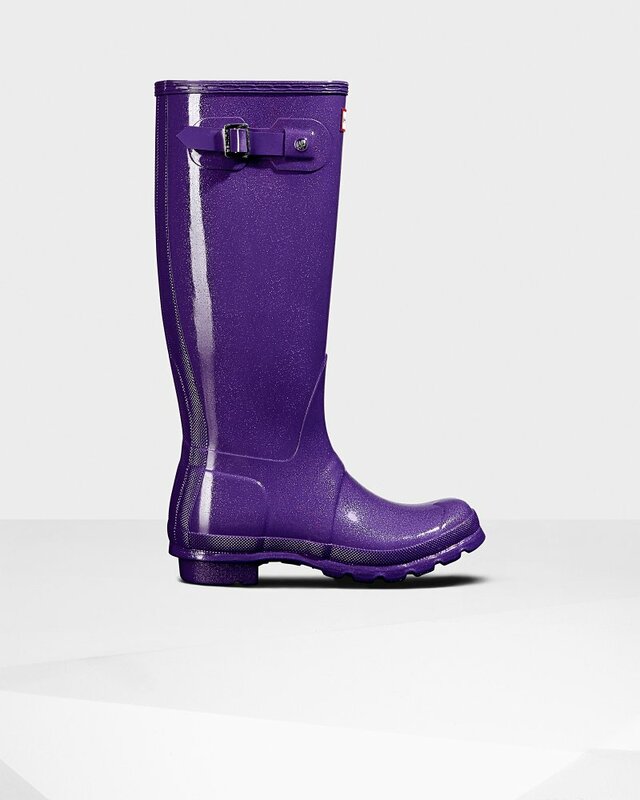 I got the star cloud boots in black and loved them so much I decided to get the purple ones too! I get so many compliments. Rated 4 out of 5 by Anonymous from Beautiful boot This boot was a dream. The only issue is I ordered a size too small and when I went to exchange they were completely out of stock. Overall, so pretty wish hunter kept more things in stock!! Rated 5 out of 5 by JAinTX from Bigger around the calf please I give them a 5 star because they are beautiful. But I can’t wear them because my calf is to big Boot is 15 inches my calf is 16. Any chance Hunter will ever make these as a Huntress? Which usually is a bit bigger on the calf or as a wide calf size. I know I’d buy every color then! I had to buy the shorter style but would love a pair of the tall. Love the Starcloud. Rated 5 out of 5 by H yank from Love the sparkle I'm loving the sparkling boots, a bit more pronounced than the pictures but still cute. Very comfortable. Satisfied with my purchase. Rated 5 out of 5 by Km12 from Love the style!! I bought these a month ago and I have got tons of compliments. This is my first pair of Huntington’s and I can’t wait to order my next pair! !